They say, the hair is like a crown. When it comes to hair, I always find it hard to make a decision. Even going to the salon worries me. Even trimming! There are many times I end up with hairstyles not of my choice. When I was 8, my mother ask the hairdresser to give me a boy's haircut because she said it was hard for her to kept on tying my hair and I end up unravelling it. That year when I started primary school, I feel like all eyes on me because of my hair. It did however tame my boyish behaviour and it made me stay home for a long period of time. That must have been why I love staying at home up to this moment. So, I've been contemplating whether I should cut my hair or not. Few weeks ago, me and my mum went for a hair trim. 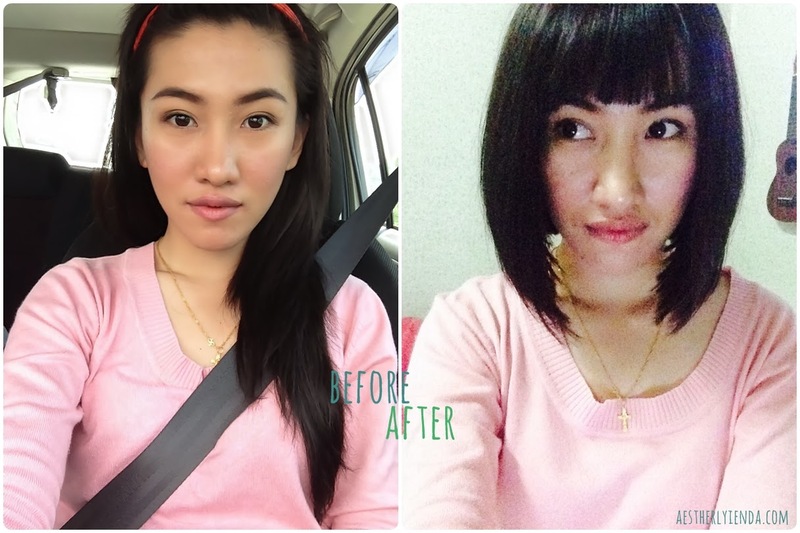 I thought hair trim would help me with hair falls and dandruff like always. It didn't. I didn't have split ends, it's just that two problems. Just 2 weeks after, mum cut her hair super short! I asked her if I should cut mine short too because apparently the mother said I'm having a bald spot and that my hairline is uneven. I noticed it too mum. Thats probably because I had to tie my hair up for work everyday. It kind of stresses me out. So, I made a decision on cutting it short. The Spouse and I went to meet our trusty friend Daniel of Infinity Salon for a haircut yesterday. Damn it was a long line of customer! We waited for like 1 hour. Thank God for technnologies. Daniel asked me whether it was my first.. Yes!! For a few years I've had my hair long. Now I had to cut it. He told me he'd be quick so I'd have no time to regret my decision. I took a deep breath and Okaaaay, he said. snip. snip. I know this is not a very pleasant photo but this is actually the reason why I needed the haircut. Hair falls! Face was red the whole time and I was afraid he's gonna give me a cut I despise. But he told me not to worry and that he'd give me a good haircut. In short, trust the hairstylist (which I found really hard doing so). Before you ever decide to cut your hair, do the pros and cons. My pros was 80% higher than my cons so I feel better but, even if the pros are higher, always opt for a hairstylist whom you think can give you the outcome you desire. Some hairstylist won't even give you opinions. Some just wanted to sell their products. If you're just in it for the trend well, it's your choice. If long hair is for you, never ever cut it above your shoulder. At least you can still tie it. 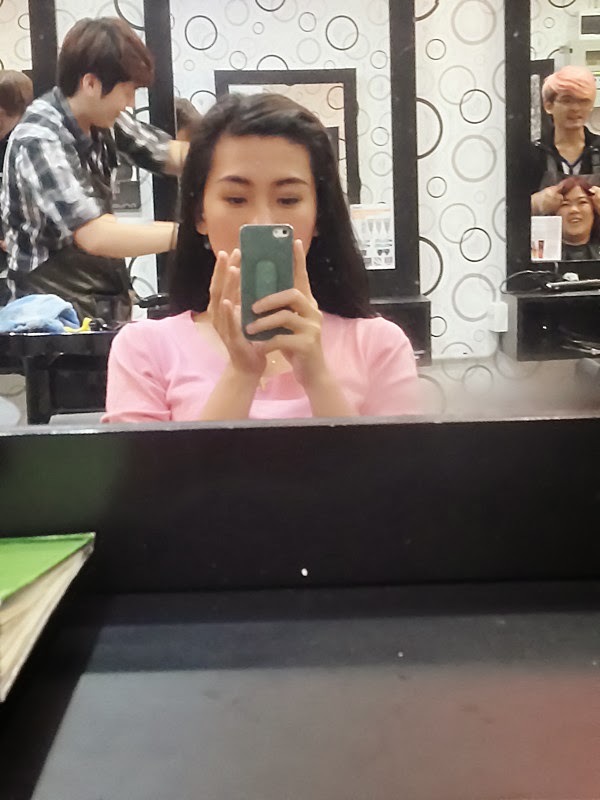 I do like my new hair eventhough the mother said it's Saloma's hairstyle. I also love it that Daniel didn't layered my hair and made it thin because I would be devastated. No matter what happen, I always want to make sure my hair is thick. I say, do not be fooled by the before picture. Hair might look tamed and you-don't-need-a-haircut there but believe me, it looks awful in real life. Spot the uneven hairline..
Come to think of it, I've had this hair cut long time ago but I got laughed off by some boy calling me Helmet. Now, isn't that not the reason I kept it long all this time? But.. It literally cut 60% off my getting ready for work every morning and.. less shampoo! Hahaha adik sya time dia kici2 bgitu jg rambut dia. Kami panggil dia pakai helmet. Btw, u look nice in tht new hairstyle. Cute and looks energetic. @StellaClaire-Richard : mmg mcm helmet but di office kwn panggil "Dora the explorer" haha. Still, kasi senang mau p kerja priority no.1.